The Blackwell Legacy is a 2D indie adventure game. It is also the first entry in the Blackwell series; And was designed by Dave Gilbert, creator of The Shiva. It is a good adventure game and was nominated for five AGS awards the year it was released. These awards are best character art, best dialogue writing, best non-player character, best use of sound, and best music. The production values are quite good across the entire board. It has great low res graphics; reminiscent of older classic titles such as Gabriel Knight: Sins of the Fathers, if somewhat less detailed and not quite as good. It even managed to win an award for its art; The AGS award for Best Character Art. Additionally, It had good voice overs and sounds effects. The story tells the tale of a young woman, Rosangela Blackwell. After the death of her aunt, she finds out about her family's history of dementia, and is soon dropped into a world she can hardly imagine, a world of paranormal activity and adventure. As such she starts off the adventure as the classic whiny protagonist, but soon after solving a few puzzles and getting a few results she begins to turn confident and competent in the face of adversity. In a nutshell the story is about ghosts and helping them find peace, and as such is a pretty standard story centred around a medium; Well done but not too inspired. As a medium, Rosangela has a spirit guide, Joey Mallone, who gets her acquainted with the supernatural world. He also follows her around; Helping her solve a puzzles and talk to the troubled spirits they encounter. Their shared mission is to seek out tormented souls and help them find peace. This is mostly done by researching their past lives and shocking them into a lucid state by using this personal knowledge. 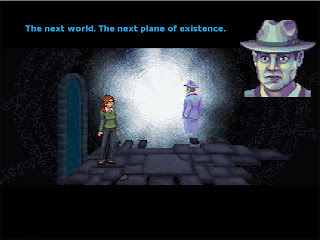 What makes The Blackwell Legacy unique is how the user interacts with the game world. The interaction is extremely streamlined, you cannot even use inventory items with the game world; Instead if you have the item needed on you it is automatically used. This of course prohibits most classical adventure style puzzles; Which is a double edged sword. While it is nice to be away from the often tedious inventory based puzzles; What replaces them, for the most part, are dialogue based puzzles, and as such the game is very story heavy. In addition to the plethora of dialogue puzzles, their are a few interesting and sometimes unique non dialogue puzzles. The notebook system particularly is reminiscent of classical inventory puzzles. As you go around talking to people you collect clues in your notebook, and at anytime you can view those clues and try to make sense of them. You make sense of them by combining them, much as you would two items. In addition to all the previous mentioned puzzles types their are also are few other puzzles. These in my opinion are the best part of the entire game, and very enjoyable and unique; So I will not spoil them for you by telling you all about them; But sufficed to say their are reasons for both puzzle lovers and story lovers to play this title. Adventure Lantern is a game review magazine distributed in pdf format. It focuses mainly on adventure titles, but reviews all game genres. In addition to the reviews it also does some previews and interviews. The first issue with one of my reviews has just been released. In this issue my review of Hammerfight has been reprinted, with minor changes and addendums.